The long run is a staple in almost every runners weekly training schedule. It doesn’t matter if you’re training for the 5k or the marathon, more than likely, you have at least one day designated as your long run day each week. However, despite the near universal application of the long run, many runners don’t know how fast they should be running for optimal benefit. If you run too slow, you won’t produce significant stimulus and adaptation. Run too fast and you run the risk of not being recovered for your next run. Making things more difficult, long runs can serve multiple training purposes; each with its own set of intensity and pace recommendations. So, what is the optimal long run pace? In this article, I will outline the different types of long runs and then examine the scientific literature behind easy long runs to help you determine your ideal pace. The first step to determining long run pace is assessing the purpose and intensity of your long run session. Not all long runs are created equal. 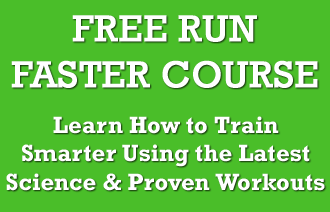 Some long runs are designed to simulate marathon conditions or teach you how to finish fast. These types of long runs are considered a hard workout and you have extra recovery days scheduled after your session to recover. On the other hand, some long runs are considered easy. They are meant to be run at an easy intensity to build aerobic endurance and put “time on your feet”. These types of long runs aren’t exactly recovery runs, but they aren’t designed to be hard either. If your training schedule is well-written, it should be relatively clear what the intensity or goal of the long run is. Understanding the purpose and desired outcome of your long run is important because long runs are just one piece to the training puzzle. For example, race specific long runs are an integral part of a training plan and can help take your running to the next level. However, if your long run is designed to be a relatively easy day and you run too hard, you’ll start your next workout too fatigued and risk poor performance and injury. Luckily, your hard long runs already have predefined paces. So, you don’t need to worry about what pace to run. But, what about those easy long runs on your schedule? How fast should they be an why? What is the optimal pace if your long run is easy? Capillaries are the smallest of the body’s blood vessels and they help deliver oxygen and nutrients to the muscle tissues. The greater the number of capillaries you have surrounding each muscle fiber, the faster you can shuttle oxygen and carbohydrate into your muscles. Capillary development appears to peak at between 60 and 75 percent of 5k pace. This isn’t to say that running really slowly or much faster on occasion doesn’t have any benefit. However, running much faster or slower than this pace doesn’t significantly increase or decrease capillary development. Myoglobin is a special protein in your muscles that binds the oxygen that enters the muscle fiber. When oxygen becomes limited during exercise, myoglobin releases the oxygen to the mitochondria. Simply speaking, the more myoglobin you have in your muscle fibers, the more oxygen you can sequester to the muscle under aerobic duress – like during a race. While all muscle fibers contain myoglobin, the ones we’re most concerned with targeting during the long run are the Type-I (slow twitch) muscles. Research has shown that maximum stimulation of Type I muscle fiber occurs at about 63-77 percent of VO2max. 63-77 percent of VO2max is about 55-75 percent of 5k pace. Glycogen is how the body stores carbohydrates in the muscles for usable energy. While this isn’t important for races that last under 90 minutes, when racing the marathon, the more glycogen you can store in your muscles, the longer you can prevent the dreaded bonk. The goal with easy long runs is to deplete the muscles of their stored glycogen. The body responds to this stimulus by learning to store more glycogen to prevent future depletion. The faster you run the greater the percentage of your energy will come from carbohydrates. While there isn’t any scientific research on the optimal pace that burns significant carbohydrate while still providing enough energy to get through a long run, experience and the study of elite runners has shown that a pace of about 65-75 percent of 5k pace is optimal. Two researchers, Holloszy (1967) and Dudley (1982) published some of the defining research on optimal distance and pace for mitochondrial development. In short, Holloszy found that maximum mitochondrial development occurred at about 2 hours of running at 50-75 percent of V02max. Likewise, Dudley found that the best strategy for slow-twitch, mitochondria enhancement was running for 90 minutes per outing at 70 to 75 per cent V02 max. The body of evidence is clear, your optimal long run pace is between 55 and 75 percent of your 5k pace, with the average pace being about 65 percent. It’s also evident from this research that running faster than 75% of your 5k pace on your long run doesn’t provide a lot of additional physiological benefit. Therefore, pushing the pace beyond 75% of 5k pace only serves to make you more tired and hamper recovery. In fact, the research indicates that it would be just as advantageous to run slower as it would be to run faster. 50-55 percent of 5k pace is pretty easy, but the research clearly demonstrates that it still provides near optimal physiological benefits. If you’re feeling tired and the long run isn’t scheduled to be a hard day, don’t be afraid to slow your long run down. My suggestion is to start on the slower side of the pace recommendations (50% of 5k pace) and slowly pick it up through the run if you feel good. Consider this research when debating the pace of your next long run and make it count! Thanks for the email newsletter you send out. I enjoy reading them. I have been a runner for 31 years – I started when I was 16. Most of my professional career has been spent in the physical preparation (or training/coaching) people in running based sports. i also worked for 4 years as a sport scientist. With an ever-growing (45) group of recreational runners it is always a challenge, as coach, balancing the many pieces that comprise and individual training plan and then the phases sand sessions to support meeting the objectives of the plan. Science and art both play a role. Speed or pace (not always the same as intensity) of different sessions – or parts of sessions – to meet given objectives is often a discussion point. And, “easy” pace doesn’t necessarily equate with easy effort after 90+minutes. For this reason I tend to use “slow-ish” of thereabouts. That said, as you mention, the ‘pace’ of long runs os often dependent upon their purpose (or objective/s). Sometimes the ‘purpose’ is equally psychological and emotional (eg. confidence, self-efficacy, self-esteem), or even social, as well as physiological (and musculoskeletal). I read your ‘optimal pace for the long run’ article with interest. It is insightful and well written. Although the studies from 1967 and 1982 are well dated that isn’t to say they can’t be of value. 1) 5km races are more often than not run at 95-100% VO2max. This being the case, the “percent of 5km” guidelines you give are significant underestimates. they should nearly be identical to the “percent VO2max” column. Just a thought. [62.5%= 7mins/km; 75%= 6mins/km]. Are you certain about these? Well done again on your blogs/emails overall, and thanks for providing me with the opportunity to write to you. Thanks or the comment and sharing your questions. I too tend to use slower paces when assigning easy paces. In my opinion, easy means easy, so the coal is to just run easy; however, the number one question I receive is “what is my easy pace”. That’s why I wrote this article. You’re right about the date of the studies, but there just hasn’t been anything that’s looked at these aerobic development factors in runners recently. I don’t think the physiology has changed, so I still think they are accurate. 1) I think the 5k to VO2 max paces are pretty close – within that 5% difference. You have to remember to that beginners will usually run a 5k at closer to 90% of Vo2max because they don’t have the skills and training to push themselves. This article is aimed more to beginners. Most experienced runners don’t need to be told what “easy” is. 2) You’re making a mistake with your calculation. 50% doesn’t mean half of 5k pace. It means literally, 50% of/slower than 5k pace. In your example of a runner with a 5k pace of 4:00, 50% of 4:00 is 6:00 pace. I think you’ll find that isn’t that slow for a recovery type run. Plus, 50% is the very low end of the aerobic development. On average, it seems 65% seems to be the number that hits all four systems. As such, you’re looking at 5:20 pace or so. Hope that makes sense and thanks for reading! Hi Jeff, I was also confused by your use of percentages when explaining paces. When people use percentages and they say “[x] should be [y]% OF [z]”, it means x = z * y%, not x = z * (1+y%) as you meant in your article. 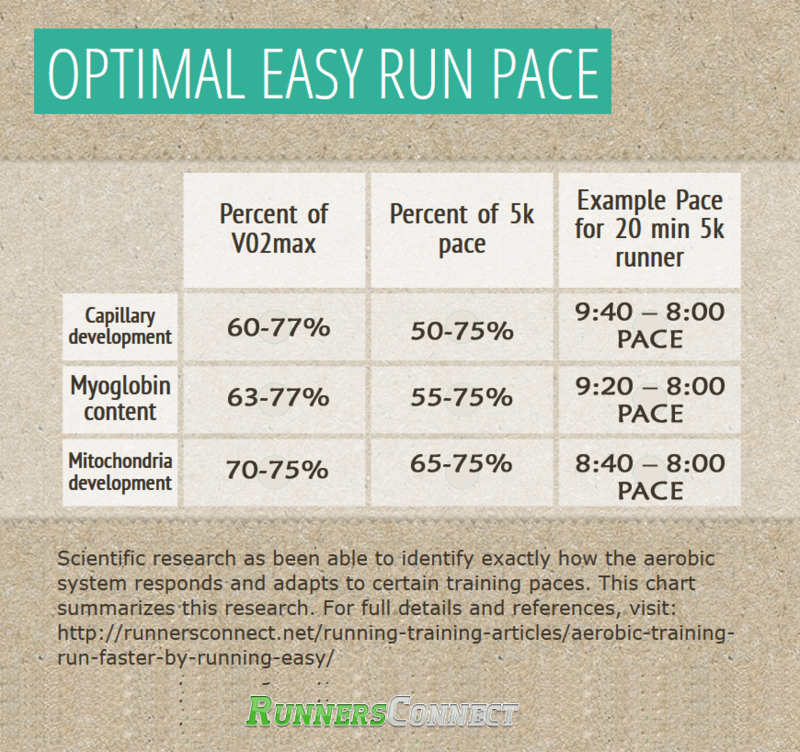 To get the meaning of the percentages that you intended, you should write that your training pace should be [y]% SLOWER THAN your 5k pace, not [y]% OF your 5k pace. Sorry for the confusion. I updated a post to include a calculator. Enjoy! I saw what happened at this year’s Marathon. I am sedentary by nature, but want to begin training in the hopes of qualifying for the 2015 race. Once I begin, I hope to set up a website to track my progress and encourage others like me to show the runners and victims of yesterday’s tragedy that their loss did not go unnoticed and in fact is inspiring positive life changes in others! How is it best to begin? This may seem a emotional response, but I am committed. Former military, but out for a hip expanding decade. Just need a reasonable restart since the information on effective exercise has changed a lot. That’s a great way to celebrate the lives of those lost. To get started, I would find a good plan and make sure you stick to it. You may have to start with some run/walk, but if you’re able to take it one day at a time, you’ll get there. We have some great basic training plans that would help guide you if you need. Best of luck on your journey! 20min 5k is 6.4 min/mile 6:24 in mm:ss notation. To find 50%: 1-0.5 = 0.5; 1+0.5 = 1.5; 6.4*1.5 = 9.6; 9:36 mm:ss agrees closely with your 9:40. To find 75%: 1-0.75 = 0.25; 1+0.25 = 1.25; 6.4*1.25 = 8.00; 8:00 mm:ss agrees with your 8:00. To find 55%: 1-0.55 = 0.45; 1+0.45 = 1.45; 6.4*1.45 = 9.28; 9:17 mm:ss agrees closely with your 9:20. To find 65%: 1-0.65 = 0.35; 1+0.35 = 1.35; 6.4*1.35 = 8.64; 8:38 mm:ss agrees closely with your 8:40. Yup, you’ve got it right. Interesting article. It would be wonderful if you could provide the sources you used to develop that handy-dandy chart. Quick Question from a beginner: how long does the effect of a correct long run pace remain? For instance, do the capillaries keep developing over a period of time with say, weekly long runs or do they come back to their pre run shape after a day or a few hours of the end of the long run. The work outs are awesome and I love the speed training segments but I’m wanting to get in to the 3:10 – 3:15 range. What else can I do to run a 7-minute mile for 26.2 miles? Thanks for the explanation and the calculator. To plug in the number on the calculator, do we just run a 5K (for example) as fast as we can? Hi Joe, yes, if you do not have a recent 5k race to compare to, it would be good to see where you are at before using this guide, or you can use a previous 5k, and just be prepared to adjust slightly.